Brainstring Houdini Puzzle - Can You Help Houdini Escape The Trap? Can you free the master escape artist from the clutches of the Brainstring knot? Great little brain puzzle to keep you busy. Harry Houdini was always known for his skills at breaking out of tough spots like prisons, chains and even a straitjacket or two. But now, the master of all escape artists is trapped and needs your help… from the Brainstring knot! This Brainstring Houdini Puzzle should keep you busy for a while. Tie a knot around the escape artist by moving the strings along the tracks. Now the trap is set. Sort the strings in order for the red ones to be on top/bottom and the black ones on the sides. Now test your skills by trying to untangle him. Once you get the hang of it, then time yourself to see if you can beat the clock! 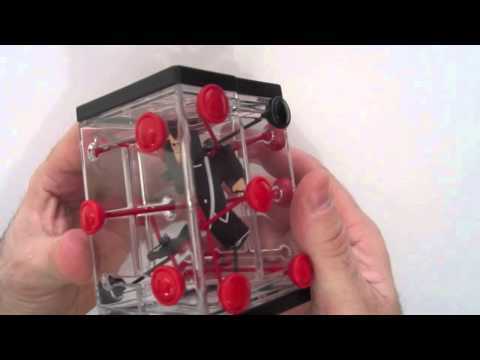 Buy the Brainstring Houdini Puzzle now to get rid of your boredom.